Hiris was released by Hermès in 1999. The name refers to the iris flower, but also to the goddess Iris, who like Hermes was celebrated in Greek mythology as a messenger of the gods. The fragrance was created by nose Olivia Giacobetti, who used iris in the top, heart, and base notes, along with neroli, carrots, coriander, hay, rose, ambrette seeds, almond wood, cedar, honey, and vanilla. The opening notes are simply stunning: crisp, dry and peppery iris, with lots of dirt-caked roots and greenery. I did not recognize the carrot note until I smelled L'Artisan Fleur de Carotte, and so learned what a carrot translated into perfumery smells like. Yes, there is carrot in Hiris too, although only for a brief while. As it dries down, the high pitched, almost metallic hum of the top notes calms, and the hay and wood notes intensify, along with a tiny whisper of rose. Like many Giacobetti fragrances, it feels light and tranparent, like cool air is floating over the heavier, warmer notes of dirt, roots, and bark. Giacobetti's genius lies in the fact that she always seems to accomplish this without using a big ozonic note: her perfumes never smell like air freshener. The far dry down retains some of the earthiness, but is softer, more delicate, with restrained sweet notes. There is just the right amount of powder to lend a velvety, elegant finish. It is an Eau de Toilette, and while the lasting power is good, it is not fabulous. I would love to see an Eau de Parfum version, but I doubt Hiris is part of the long term expansion strategy at Hermès. It is widely available at the online perfume discounters; perfumebay has a 100 ml unboxed tester for $35.90. Great review of a lovely scent! 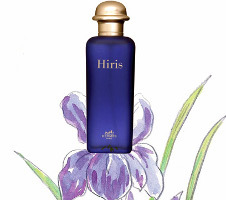 For me Hiris is an iris scent for ever mood, in any weather, it is a no-brainer iris, but in the most positive way. It is comfortably in the middle, between two extremes, Iris Poudre (sweet dressed up demanding iris) and Bois d'Iris (dirty, rooty and ragged). Thanks M. I need to try Iris Poudre again, it was too sweet-dressed-up iris for me the first time, but I have only tried it once. I love Bois d'Iris too though, and will do that one tomorrow. Great review, R! I love this fragrance, and I think that there are few irises that can surpass it. Iris is such a tricky note. A wonderful and spot-on review of a truly strange fragrance. I can't wear it myself (there's something in its overcast chill that reverberates in my head the way your ears ring after a loud noise), but I keep a bottle just to steal a sniff once in a while and contemplate the oddness of it. Irises will never be the same. I love this review. Wore three bottles or so from 1999 onwards. Now I adore Iris Silver Mist and I think it is because V made me appreciate it. Hope you are well dear R! Thanks V, it is one of my favorites too. Hiris smells like the calm fluttering of angels' wings…It is simply divine. T, I wear it so much that maybe I no longer recognize how odd it really is…but completely get the “reverberates in my head” part, and I know many people find it too sharp in the top notes. Thank you N. I love Iris Silver Mist too & will do that on Wednesday. What a great description R!! To tell you the truth, I don´t know what to think about iris fragrances: I thought I liked Iris Poudrée, but after re-testing it, I´m not so sure anymore – it´s really a bit on the sweeter side. Since I´ve tested iris fragrances for the last few days, I´m really looking forward to comparing your impressions with mine. I feel rather silly, K, that I really never recognized the carrot until I smelled the Fleur de Carotte, which is probably another OG scent. Do try it, it is really a beautiful fragrance. Hiris is so different from Iris Poudre that they might as well be from different planets. What else did you try, S? a great review of one of my very favorites! It also lasts all day on me, so I'm one of the lucky ones. This is really the only iris-based scent I care for. Wow, all day! I am very jealous, I get maybe 4 hours at most, and even then it is faint. Gosh this sounds lovely. Wonderful review. Judging by the few fragrances of hers that I've tested, I think I am a fan of Ms. Giacobetti. Now I have to figure out which retailers in my area carry Hiris so I can give it a sniff! I'm eager to try the other Iris fragrances mentioned in previous posts. Anyone have any particular favorites? I also tried the following: TDC – Bois d´Iris, SL – Iris Siver Mist & have to get hold of a sample of Iris Nobile – after reading your review a while ago I´ve tried it once & liked it very much – perfect for autumn, I think. But after my experince with Iris Poudrée I want to try it ago…who knows what I´ ll think of it now? I also would like to sample MPG Fleur d´Iris. I don't see Hiris in very many department stores these days, so unless you have a Hermes boutique nearby you might have trouble. Iris scents are based on the root, not the flower, so it isn't a scent you would recognize from nature, but once you have smelled several iris fragrances you will pick up on the note. The root! No wonder I've always wondered why they don't smell floral at all! A, I am so glad you discovered this beauty! It is one of my all time favorites. I really love this scent, but I'm afraid it's already out of the Hermès' range… It's not in their website anymore and really hard to find here in Brazil. But why would they take it out of the website?! Let's hope. They promise me it is not there only because it cannot be ordered (and they don't allow backorders). However, they say many of the boutiques in the US still have it, and as soon as they get more, it will go back on the website. This is a classic scent with a cult following. I just ordered a new bottle for spring. It is the dry down that people can't get enough of. My husband just loves it on me. It is still one of my favorites too! it has the strength and bitternes of the root, also the stability (at least on my skin), all things i need to compensate my person which is chaotic and unattentive sometimes. so talking about scents fitting to a person it gets very psychological. So glad your purchase worked out for you! Hiris really is a great scent. I wear this following some comments from my fellow Basenoters. I love Infusion D'Iris, but I just think it is slightly too feminine for me to pull off wearing on a day to day basis. This however I can, lightly applied it can be worn easily by men – particularly any man who can wear Fleur du Male with confidence. On a male skin the woodier basenotes are more apparent whilst still retaining the beautiful lightness of the Iris. It's a remarkable fragrance that men should certainly consider if they like elegantly rendered florals. I think that Hiris is slightly smoother on the nose than Infusion D'Iris which has a certain sharpness to it in the heart notes which Hiris doesn't. But hey, all our skins are different so different aspects come out according to our diet, hormones, body temperature, diet and atmospheric conditions! As a true Iris lover – Hiris was a must try for me. Before I actually smelled it phisically, I read a lot of reviews and comments about it, and I must say I felt like I already new what it smelled like way before I had my first sample. One thing I am very happy about is that I had such a delay when it came to trying Hiris, it truly is one-of-a-kind fragrance, one of the nicest perfumes ever. If I had smelt if before I grew in my perfumania, I would have memorized it as a “weird” scent. It was a perfect time to try it, not too long ago, when I learned to appreciate, the carrot note for example! I find it just stunning, perfect and I go through my bottle like water or the oxygen.Such a transparent scent, so mettalic, powdery, rooty and NOT too heavy. I am just so in love I could use it all the time! I am trying to remember now when I smelled it — in other words, how long I'd been interested in perfume. Can't remember! But I did love it right away. What are your other favorite iris scents? My iris favorites are Iris Nobile (see my nickname?) and hiris now. I do like Infusion D'Iris but am still not sure whether it's going to be my own scent. I guess too many people are using it now, there is no magic to it in my opinion. I also heard that Chanel no. 19 is an iris scent. I have a bottle, it was a gift… I like it but not as much as my beloved Hiris or Nobile. Well, I should say I appreciate it, no. 19 is a classic, I really shouldn't say it's too old for me… (I'll be turning 21 this month) but no. 19 just lacks that seductive sweetness to me, at least coco perfume, which is a classy one too, is a lot more sweet! I'd also like to try Iris Silver Mist, maybe one day… Perhaps I can buy as decant too. It's on my “must have” list so we'll see. Do try Iris Silver Mist, and Chanel 28 La Pausa! Hiris sounds fabulous! Is there a way to get my hands on a sample smaller than the 100 ml tester you mentioned? Can I just add that this is a fabulous fragrance to layer over fragrances which also feaure Iris. For example, I wish the Iris not in Prada Amber for men were stronger, so I mist this over the top and the combination is fantastic. The same is true when you mist this over Dior Homme. Try it, it's a wonderful effect. I've never smelled Dior Homme and will do so now. Another one on my “must-try” list. I love reading this blog because I simply enjoy reading great reviews, and people's opinions help me a lot too. By the way I just wanted to add that Hiris, since this whole article is about Hiris to begin with, is an exceptional fragrance, because like someone mentioned earlier it combines rooty, earthy, green notes with this light, sweet, transparent, cool… it is an unusual effect and I am loving it. Afterall it's a perfect summer fragrance with an earthy depth. I have actually noticed that several Iris perfumes, that might be different from each other in some ways, they all share the same sweet-intriguing heart, that of iris. I adore Hiris, and am always glad to see it find new fans — I will seriously cry if it gets discontinued! Olivia Giacobetti seems to have created many of the scents I enjoy. Along with Jean Claude Ellena. I am adding Hiris to my must be sampled list. My sample collection is growing rapidly, but I am not complaining…yet. Hope you'll love it! OG & JCE are 2 of my favorites too. Newbie question: is the note carrot, or carrot flower? Just wondering, since I'm at the start of my sniff journey… Queen Anne's Lace is wild carrot, and that flower does have a scent — dusty, herby, only faintly floral, but I find it pleasant. Well, I guess it's carrot — but bear in mind that these notes are fancifully named to begin with — there's no real “carrot” in the scent. Just scored a sample of Hiris and am looking forward to trying it. And if I don't like it at first, I'll try it a few more times just to be fair. Just tried it today. Loved the top notes… somewhere during the drydown I was getting some mustiness, the kind that makes me think of my great-aunt's face powder. Bleah. It lasted about 20 minutes, and then I began to get the lovely cool/warm drydown. Any idea what that might be? (I got something similar in Bulgari Pour Femme, too.) I'm not sure whether I'm willing to suffer 20 minutes of stale old closet for the rest of the generally pleasurable experience. No, sorry, no idea. It doesn't smell musty to me at all — although it does smell very earthy. Maybe try Serge Lutens Iris Silver Mist instead? Hiris’s top notes remind me of that first smell of wild fresh air you get from someone stepping inside from a windy day near the sea. Very specific I know but Hiris somehow encapsulates that within its beautiful depths. A true work of art. After sampling I picked this up recently. Although I was looking forward to wearing it Spring/Summer, I’ve been reaching for it as a sort of prelude to Spring. For everyday this past week of light snow/sleet, we’ve gotten a few teasing days of sweater-only weather. This scent has been keeping the possibility of Spring much nearer to me than it, in reality, actually is. I can’t seem to get enough iris right now and I’m eager to test Hiris even though LT called it “Orrible” and gave it one star. It is still available from many online discounters and through amazon.com for a reasonable price. I love VC&A Bois d’Iris and recently revisited Iris Silver Mist which I must have. I’ve been dreaming about it. Thank goodness for decants. Decants are a very good thing — and I adore Hiris. Hi Robin, to your nose how does this compare to Iris Ukiyoe? I sampled IU awhile back, and now I’m wearing Hiris and they both seem really similar from what I remember of IU… just curious if your more experienced nose can point out any differences? I don’t think of conventional iris as a true floral note — it’s from the root, not the flower, and to me it smells like it: it’s more earthy & vegetal than petally (I hate the word petally but can’t think of how else to say it here). The Hiris takes that rooty note and gives it a cold metallic twang, and emphasizes the vegetal part and the powder. Iris Ukiyoe, to me, is more of a watery fresh floral, and not so much about the root at all. That said, I think they’re both classified in the same fragrance family: green floral.